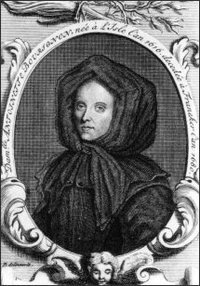 ... 1616 (395 years ago today), Antoinette Bourignon de la Porte was born to a wealthy Catholic family in Lille, the Flanders city then part of a Dutch republic and now part of France. Upon coming of age she refused to marry; instead, she "served in a convent," "supervised an orphanage," and "began formulating her own spiritual philosophy." Bourignon would travel to villages throughout north central Europe, set up the press she'd brought with her, and print pamphlets attesting to her mystic belief system, known as "quietism." For her efforts she would be condemned by Protestant and Catholic leaders alike, but her ideas would retain currency long after her death in 1680. Lille as part of the Dutch Republic? I don't think so. Rather, it remained staunchly Catholic and pro-Spanish -- when all about them (for ex. Ghent) were in revolt. As far as I know, Bourignon didn't get to rebel territory until she moved to Amsterdam in the 1660's.